St Peter’s Road,Chadwell. View to North during demolition of prefabricated bungalows in 1967. Poplar Walk was all prefabs. I grew up in no.6…….very happy memories. I remember Poplar Walk and most likely prefabs. You can contact subscriber Mike Pountney who has an old street directory. Not sure how you go about it. On my birth certificate it has 14 Poplar Walk, Chadwell St.Mary as my address. I was born in 1958. Anyone know if they were pre fabs. I lived at 25 St Mary’s Road before moving to Langton Way. This site brings back a lot of memories, some names I recognise. Do you remember the pig bins for food waste, didn’t they smell when the lid was left off. Look forward to hearing from anyone that remembers me. I am interested to know if anyone remembers my relatives who lived in the pre-fabs St Mary’s Road, they were Alfred N Burt and his wife Catherine, who lived at 17 and David G and Olive Burt at 19 St Mary’s Road. I hope Mike Poutney is still attached to this link. I’m hoping to get information on number 2 farnshaw road, Chadwell St Mary. It is listed on my Mother’s birth certificate. Her maiden name was Memory. When living in St Peters Road, —anyone remember the lovely firework bonfire we had.? We put our fire works together , and had half cooked baked potato’s! I have sent you a message on Facebook with an update. Yes Barry I did work for Elliott Mortlock, what was your connection? I worked for Malcolm Stockwell for many years, he died some time ago, a very nice person. Uncle George and my godmother Auntie Flo. Did you once work for Elliot, Mortlock, Busby in Grays ? jane butler (nee shaw) yes I remember jimmy goyetts pet monkey so unusual as most of us had a dog cat or rabbit!! also the mobile shop and the fizzy drinks lorry which I think was called Neptune or corona? also do you remember a horse and cart selling fresh bread? loved that smell and an ice cream man on a 3 wheeled bike. sadly my memory fails me with some names vaguely remember your maiden name jane shaw and jean dunn but cant recall the other names that have written on this page. whenever I holidayed in places like butlins. places with chalets it always reminded me of the prefab estate in chadwell st mary. Yes Ken Lawson our childhood in St Peters Road, was very happy, do you remember Jimmy Goyette, having a pet monkey?I am still incontact with Diane Stevens. Do you remember the Co Op travelling shop coming round every Friday.? Also the Fizzy drink man . And your Mum and Dad’s name ? I have a 1954 Thurrock street guide giving all the names of the people residing within Thurrock in street order. This guide also contains all the shops and businesses that were trading during that year. I lived in St Peters Road, (Jane Shaw) we moved there after the Tilbury floods, and moved to Sabina Road when the new houses were built. David (Veitch) was it your mum who made our dressing up clothes, I am sure she did, as we used to put on little plays and panto’s. Happy days. Hi I lived at 23 St Peters Road what a lovely place to live the prefabs were great (Jean Dunn) I remember the party for the Queens Coronation on the green between St Johns Road, and St Mary’s Road. i used to live in st johns road in a prefab,it was on a corner and there was a field opposite us on the east side where we used to play…not far from us there was a big house where i think the grants lived.My dad worked in the docks and brought home an ex rat life raft that we used as a big paddling pool,and i remember that half the kids in the street was in it too! !..great innocent days when i was 5…we even had a big telly with a tiny screen that a lot of the kids would come and watch hopalong cassidy…. To Mike Pountney, It is at all possible to have a copy of the directory you mentioned, particularly of Tilbury, Chadwell and Little Thurrock, I lived at 31 Gainsborough Ave from 1946/1955, it would certainly stir a lot of memories for me. I live at 29 St Peter’s road (I think) until it was demolished and then moved to a new house in Langton Way. I can remember a green area behind our prefab where as children we would always gather to play with the newly cut grass, also most of the street going to one prefab that had a television to see the coronation. Good memories. Thanks Mike. I wasn’t 100% sure but now you’ve confirmed it. I was only 5 when we moved out. Does the road still exist ? I guess I wouldn’t recognise the area now and I suppose the orchard has gone. Mike, I lived in Southey Walk at that time and I would be very interested to recall the other residents that also lived there. Hope you can oblige. Regards, Barry Banks. To anyone interested I have a Thurrock street directory from about 1953. It list all Thurrock streets and house numbers and all the names of tenants residing there at the time. Re the above, Arthur E Wright lived at No 33 St Johns, at No 1 St Peters lived Cyril Bennett, Earnest E Veitch lived at No 18. I lived at no. 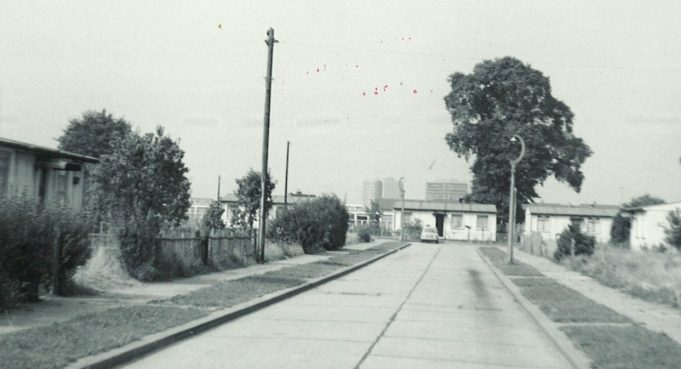 1 St Peters Road from 1949 to 1954. The prefab was next to an orchard which had a resident horse. I think his name was Trigger. I used to live at number 18 St Peters Road, which is the first prefab on the right of the picture.